We said our goodbyes yesterday. We shared donuts, coffee, memories, and hugs, and then our colleagues of the past many years moved on. The next chapters in their post-LSL lives have begun. And for those of us still here, we’ve a bit of a blank page staring us in the face, as well. But like my former colleagues, our new journey isn’t completely without structure. There is a plan. There are ideas. There are theories that we will now attempt to put into action. As I’ve repeated often, no one knows all of the answers nor how it will all turn out, but in this post, I’ll shed some light on the big-picture plan, and where and how we hope it will lead us. 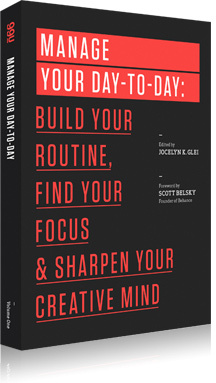 I’ve been reading a book this week entitled, Manage Your Day-to-Day: Build Your Routine, Find Your Focus, and Sharpen Your Creative Mind (ed. by Jocelyn K. Glie). It’s the perfect Kindle book for those times when you’re forced to spend hours in the dentist’s chair and on the couch, battling a nasty infection. It’s a great collection of tips from a lot of recognizable voices in the creative world. A product of 99U, the brainchild of Scott Belsky and his company, Behance, it’s a web-based clearinghouse of all things for creatives. Personally, I’m hanging my hat on the idea that creativity will be the thing that fixes and/or saves a lot of things in our society and workplaces, and if not, learning about it and adopting many practices of creatives makes me feel a lot better about myself and my work, so if for no other fact than that, I keep up. For too long, the creative world has focused on idea generation at the expense of idea execution. … To make great ideas a reality, we must act, experiment, fail, adapt, and learn on a daily basis. While he limits this thought to the creative world, I expand it to the world of libraries, education, and health care; three large and powerful institutions that merge in my academic health sciences library workplace. Implementation is always the sticking point. Putting theory into practice is hard work. It’s messy. It’s risky. And it’s bogged down at every step, it seems, by the roadblocks of resistance to change, fear of the unknown, or perhaps the most sinister bedeviller of all, apathy. So often, in an unceasing world of work stress, after awhile people simply no longer care. We just want to hold on until we can find the exit door to retirement or the winning lottery ticket. And that’s pretty sad, because for many of us, those options are no longer. Personally, I never imagine being retired. I don’t see it as a possibility in my future. But rather than let this be some kind of depressing bell toll on my work life, I’ve chosen instead to see it as a call that I’d better find and/or make my work life something that I darned well enjoy because I’m going to be doing it for the rest of my life. Whatever it may be. So how does this fit with the changes in my library now? Well, for one, it’s a message that I’ve been reminding myself of daily. It’s not the easiest time to believe it, but I’m saying it anyway. I’m believing it anyway. I’m writing it here to those who read this blog, colleagues and friends, who are facing the same. As the current president of my regional chapter of the Medical Library Association, I’m preaching it to folks in the pews. They may be sick of hearing it now, but I’m going to keep on saying it… the future is now! If you honestly believe that health sciences libraries and librarians are of value in health care, then the time is now (actually, it was about a decade or two ago, but… better late than never) to put some of our big ideas, our new ideas, our challenging ideas, into practice. We must redefine who we are and what we do, in the mindsets of both ourselves and our patrons. This is not because there isn’t value in our past, but rather that our past is not going to make it in the now or the future. Am I completely comfortable with this idea? Heck no! In fact, when I sit and think about how different my job is today, I can really struggle with the ideas that I both like the new work and that it feels like it’s taking me further and further away from what I once thought I’d do as a librarian. But that struggle is my struggle to redefine. And if it this is hard for me, I can only imagine how difficult the challenge is for someone without a 24-7 dedication to the institution of libraries and the profession of librarianship. Challenge. Capital “C”. At the Lamar Soutter Library, we’re bringing “4 Rs” to meet this “C”. This is a pretty different approach, i.e. a big change for a big challenge. It involves the nurturing of new librarians, those recently out of their graduate programs, by giving them hands-on, professional work in an area that interests them, i.e. health sciences librarianship. It brings together those of us with long term experience and expertise, with those who are fresh out of school, filled with energy and ideas and a desire to implement some of the things that they’ve learned. On paper, it’s a win-win. Those of us who need help in our new endeavors will get it through our library fellowship program. Library fellows will get a full-time, professional job where they can both learn and contribute from the get-go. And our profession, overall, will gain in the recruitment of new blood, new energy, new people to work and serve and hopefully, one day, lead. As like last week, my Library Director, Elaine Martin, prepared a presentation that describes the fellows program in detail. She’s graciously posted it on her slideshare account, making it available for others to view, utilitze and comment (Implementing the 4 Rs: Moving Forward and Defining a New Model of Librarianship). You’ll note that first and foremost, this change is about providing opportunities for new health sciences librarians. “Why?” you might ask. Why opportunities for them when we’re struggling to keep our own jobs? Well, maybe because if we don’t invest in our future now, there will be no profession tomorrow. People have been bemoaning the fact that we’re dinosaurs for too long. One way to silence those critics is to invest in the future. Was seeing people lose their jobs in order to make room for the future difficult. 110%. It was hard and it was sad and I didn’t cry crocodile tears yesterday when I said goodbye to one of my closest colleagues during my tenure here at LSL. The feelings of hurt are very real, but the hope for a different, more effective, more relevant future is what I’m holding on to now. And I believe that this program has a chance to get us there. We’re placing an emphasis on research and professional development in these fellowships. We will address “mission critical areas” in their day-to-day training and work, but will also provide an environment where they will be expected to grow as professionals and this includes gaining experience in doing research. (I have tooted this horn forever, so you can guess that it’s a BIG happy spot in the program for me.) It is at last seen as a priority that, as a profession, librarians must be competent at doing the kind of research that will, over time, build the body of evidence necessary to prove our worth and value to evidence-based administrators. Enough with the “we search better.” Prove it. Enough saying that we have a place in getting health information into electronic medical records, that we have a role in data management. Get out there and do it and then do the research necessary to evaluate these programs so that we have something concrete to stand on when we sing our praises. When are we going to manage doing this in already overloaded schedules? I don’t know! But I know that I like the idea of operating much more like the patrons that I serve (granted, they are researchers); constantly questioning, constantly researching, constantly watching and constantly stressing about where the next dollars will come from, the next grant opportunity will raise its head, the next opportunity, in general, will arise. As an exercise physiologist, I learned a lot about eustress; good stress. Eustress is the kind of stress that we need to help us grow. Muscles need to be stressed in order to get stronger. So do our minds. There may well be something to be said for embracing this kind of stress in our work today. Stability is grand while it lasts, but over time, it leads to a sense of complacency and entitlement that may well prove our downfall. Maybe it’s good to have a little stress, not so much in the area of work overload, but in that of pushing ourselves into new areas, knowing that if we don’t, we’re done. To close, I want to return all the way back to the beginning, where I mentioned that book. I’m reading that book because I absolutely know that one of the skills I have got to master in my role as an informationist, as an embedded librarian, is efficiency. I have to learn to set boundaries, plan a schedule and stick to it, take care of the big things first, and know how to say “yes” and “no” appropriately. I need to be a whole lot better at managing multiple, complicated projects at the same time. I need to articulate reasonable goals (in time and in skill) for myself and those I seek to work with. I need to take the time to know (even catalog) the things that I do really well, utilize them the most, and improve on the areas where there are gaps that can prevent success. I once heard a doc say that the hardest thing about developing and implementing an EHR system is that it’s like trying to change the engine of a 747 while it’s in mid-flight. You can’t stop what you’re doing long enough to make the changes because you risk crashing the plane. But you have to figure out how. So do we. And now I’m off to a meeting of one of our Transition Teams, the one charged with coming up with how we will provide needed reference services without staffing a service desk, a pager system, or an “on call” librarian system of any kind. Our recommendation to the Management Team is due October 1. Out of the box thinking, folks. Let’s go! NOTE: If you or someone you know is interested in applying for our new fellowship program, the announcement is now available on the Human Resources site of the University of Massachusetts Med School. If you have any questions, you can feel free to contact Elaine Martin and she’ll be more than happy to answer your questions.
. He has a generous heart and has helped so many writers. Thank you for another great resource, Valerie! I participated in a similar fellowship program shortly after graduating in 2006, and I think the key to your success in this area may be that you are changing your focus at the same time you are starting this program. As long as the culture embraces new ideas and questioning both the library and the fellows can be successful.